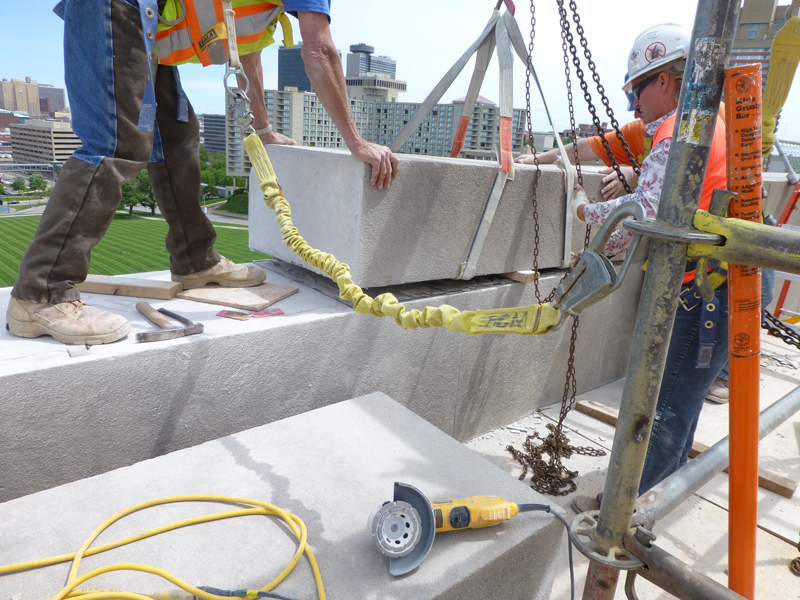 As part of the Gould Evans Design Team, our firm prepared construction documents and performed construction administration services for the exterior fountain rehabilitation work which was prioritized based upon the previous Stone Condition Assessment Report completed in 2010. 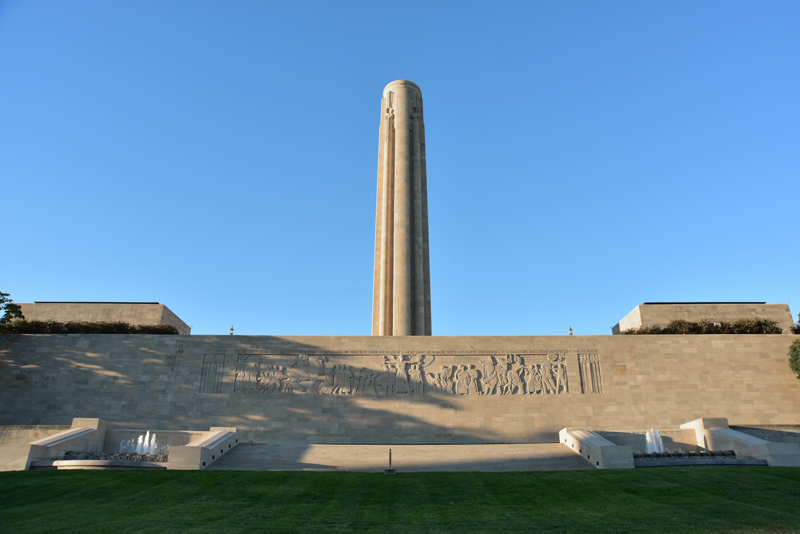 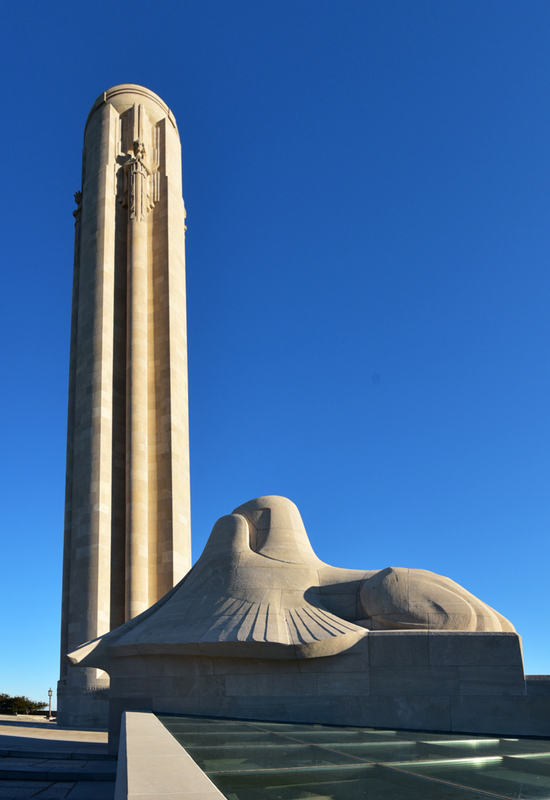 Constructed over a three and one-half year span, the Liberty Memorial was dedicated on November 11, 1926, atop a prominent site located within Penn Valley Park. 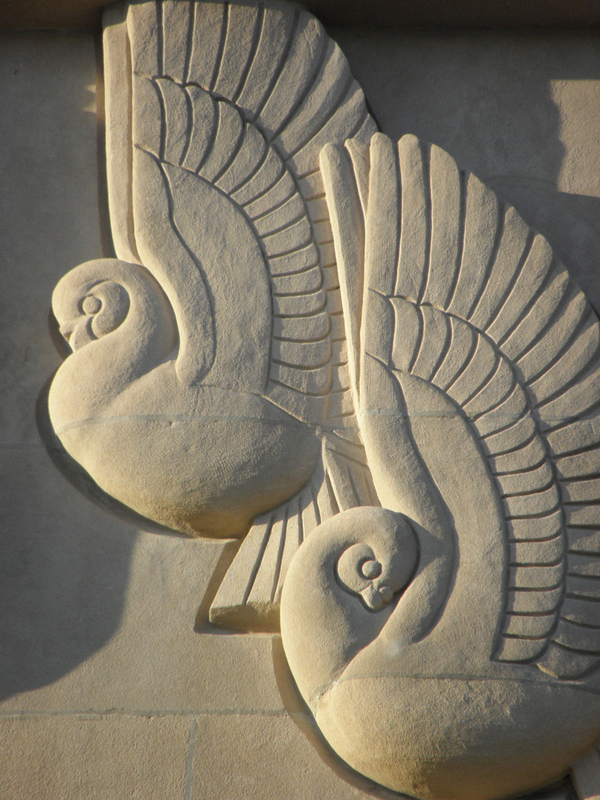 The original complex was designed by Harold Van Buren Magonigle (architect), with Wight and Wight and landscape architects the Olmstead Brothers, George E. Kessler and Hare and Hare. 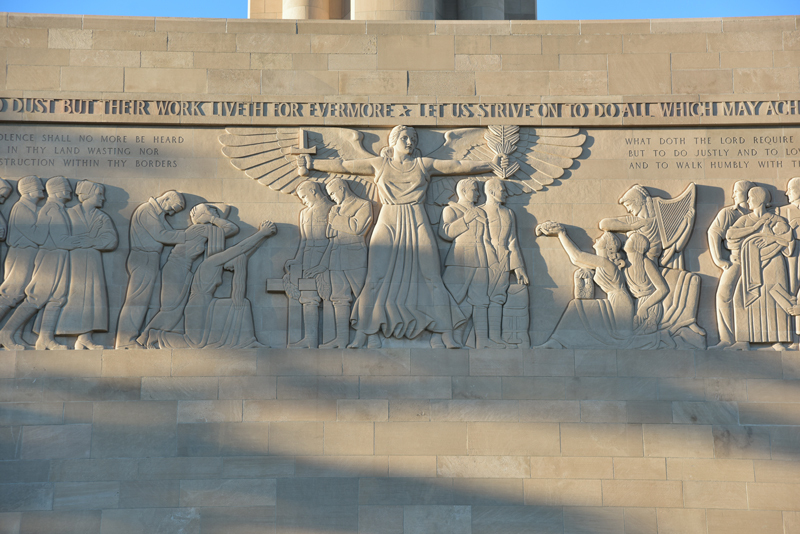 The Liberty Memorial features a central limestone tower flanked by limestone museum buildings on the east and west and the Great Frieze to the north. 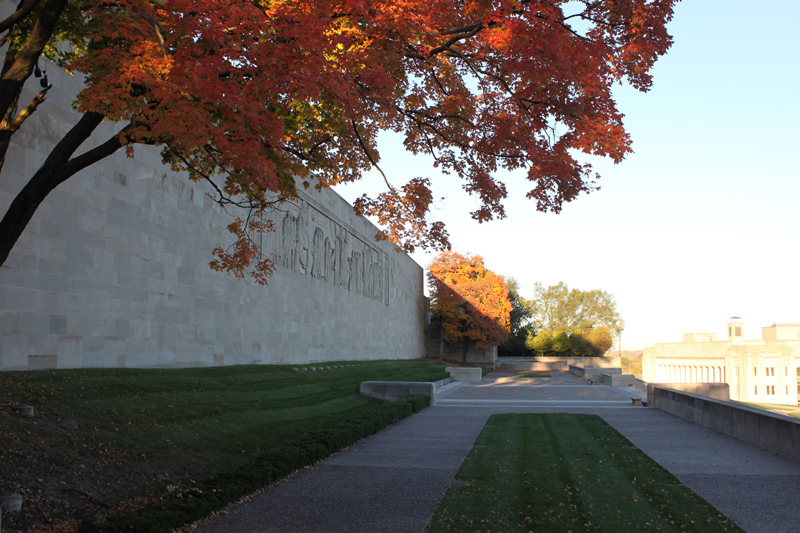 The North Fountain Court and North Stairways provide a connection from The Liberty Memorial complex above to the north lawn. 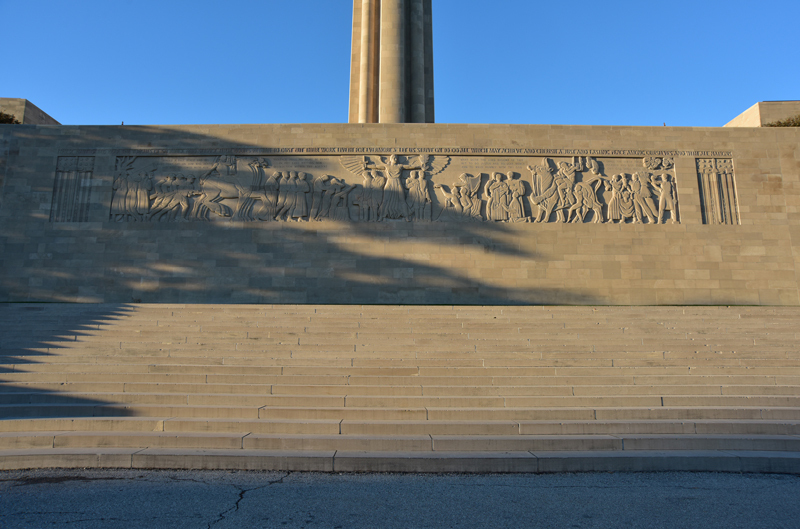 Two fountains are located on either side of the monument’s lowest flight of stairs that lead to grade. 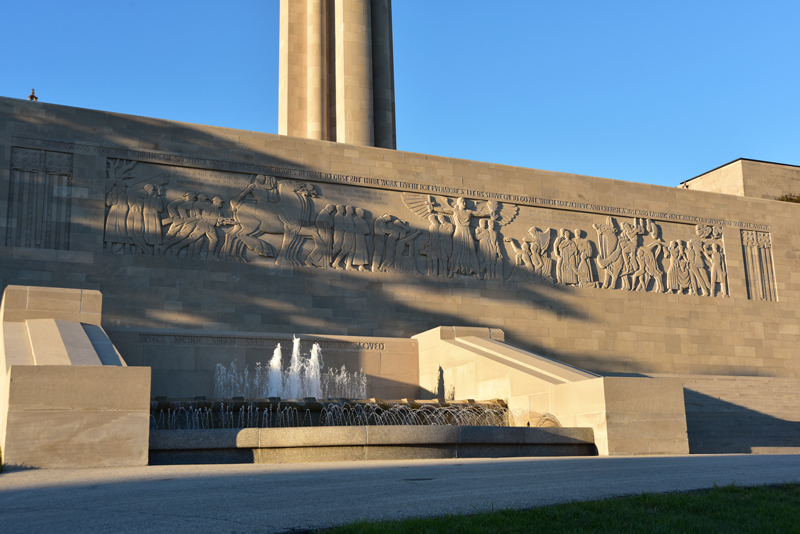 The fountains were designed by Wight and Wight and date to 1934-35, the later construction period after the main memorial structures were completed. 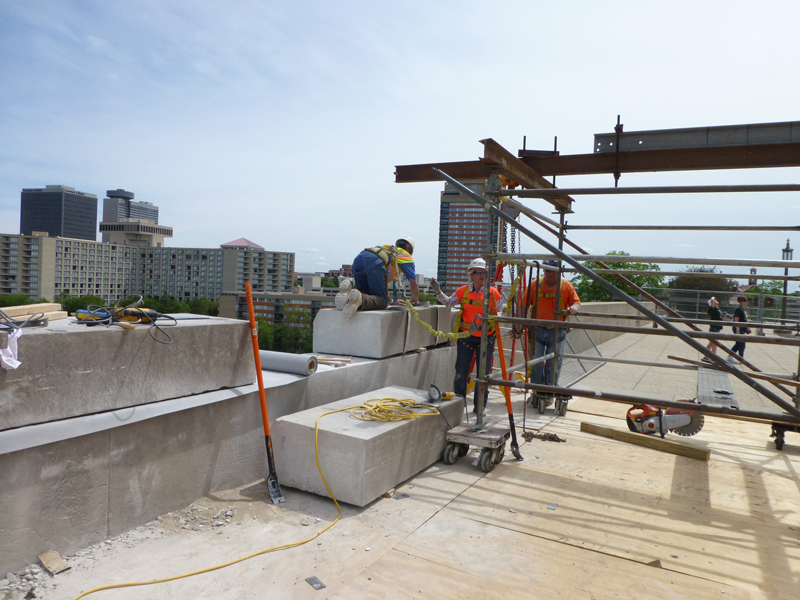 The two-tier fountains are integrated into retaining walls for the North Fountain Court and are primarily constructed of Indiana Limestone, granite weirs and basin edge, and glazed porcelain tile. 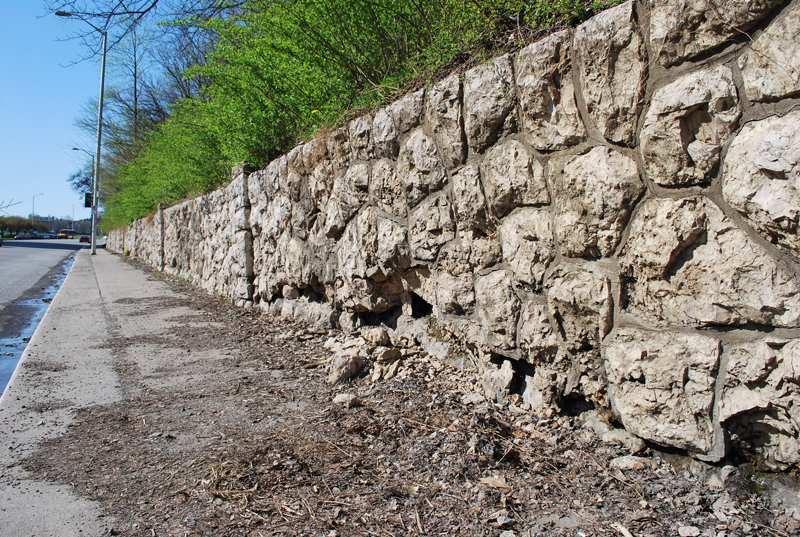 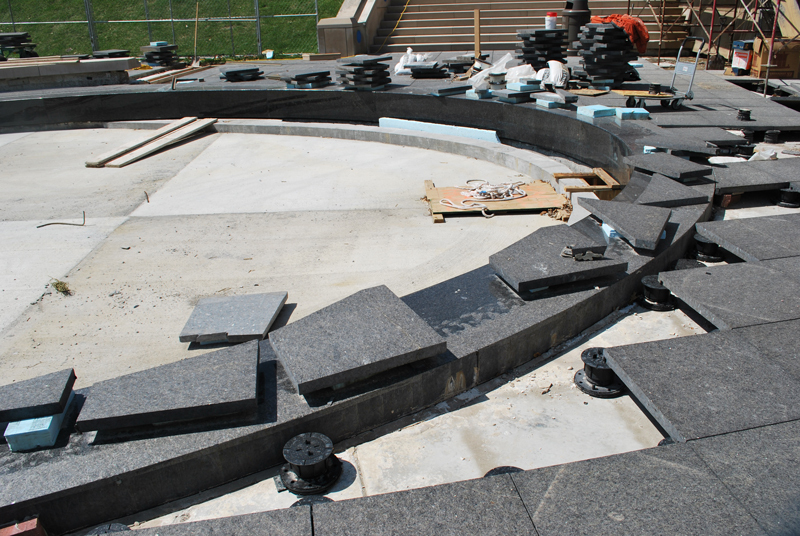 Detailed construction documents (drawings and specifications) were produced for the fountain rehabilitation work which included: repointing, stone patching, cleaning and the application of a penetrating breathable water repellant and mechanical/plumbing upgrades. 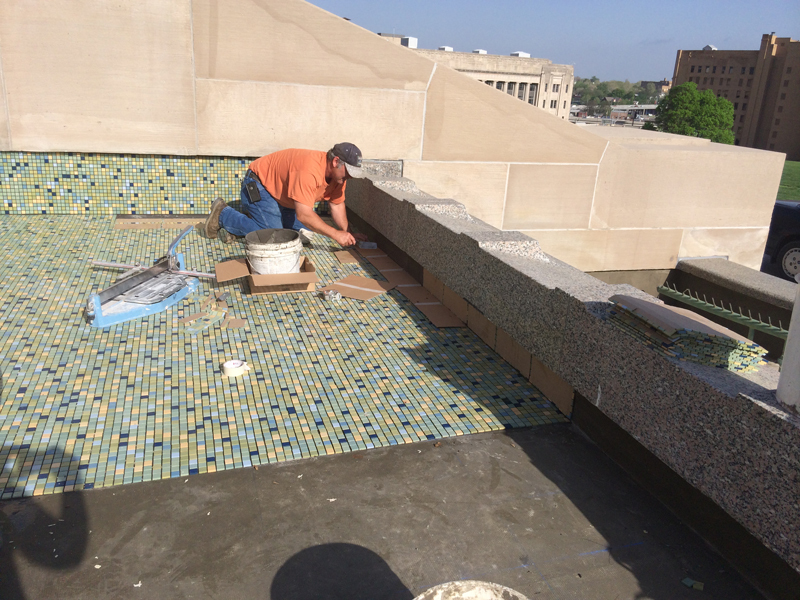 The original glazed fountain tiles had been replaced during a previous rehabilitation and had deteriorated over the past 15 years, requiring replacement. 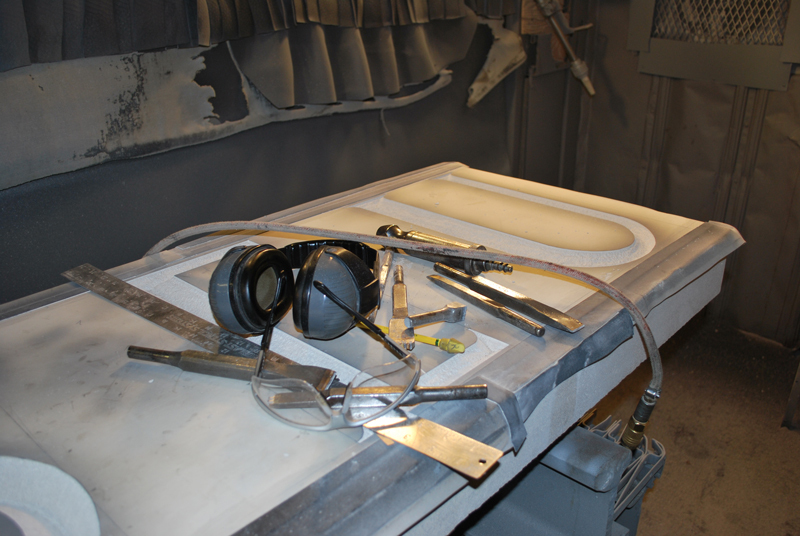 Several original tiles were located in the museum archives and were utilized to produce custom handmade through-body porcelain tiles matching the original tiles in-kind, matching all dimensions, color and glaze finish. 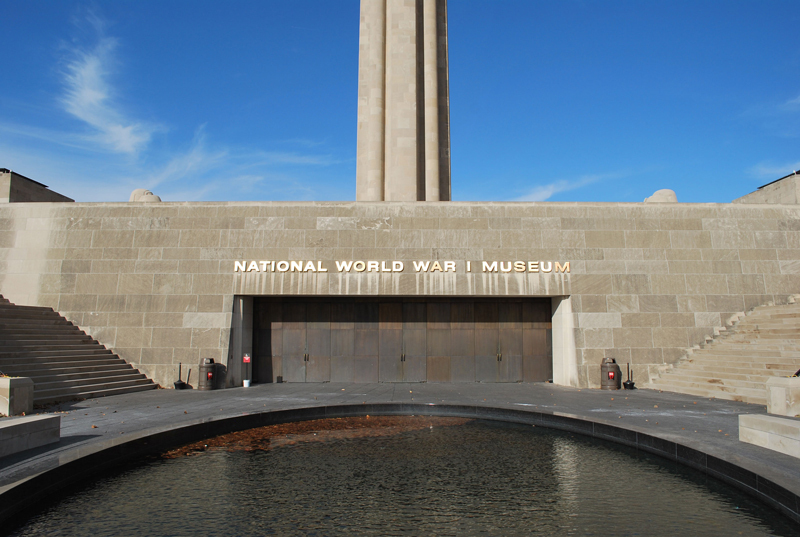 The South Entry Fountain was constructed as part of the Liberty Memorial major rehabilitation and new construction completed in 1999-2002. 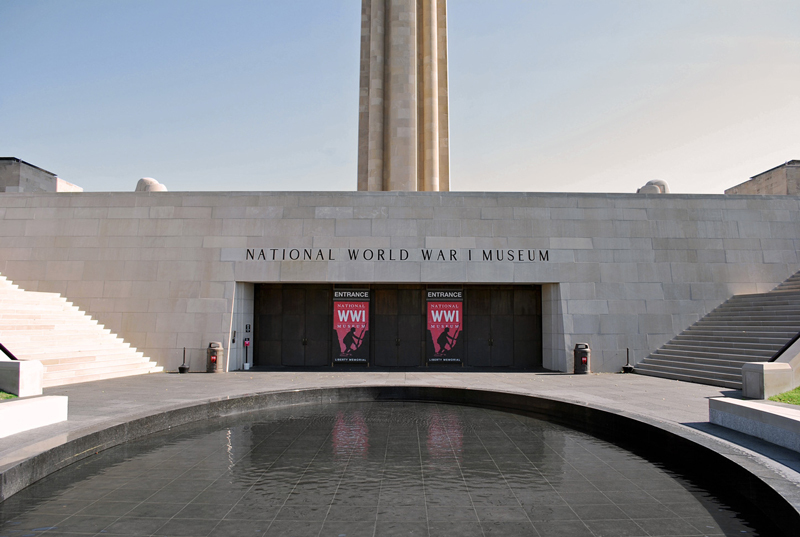 The oval fountain is located on the south axis of the memorial within the New South Entrance Courtyard which is accessed from the South Mall. 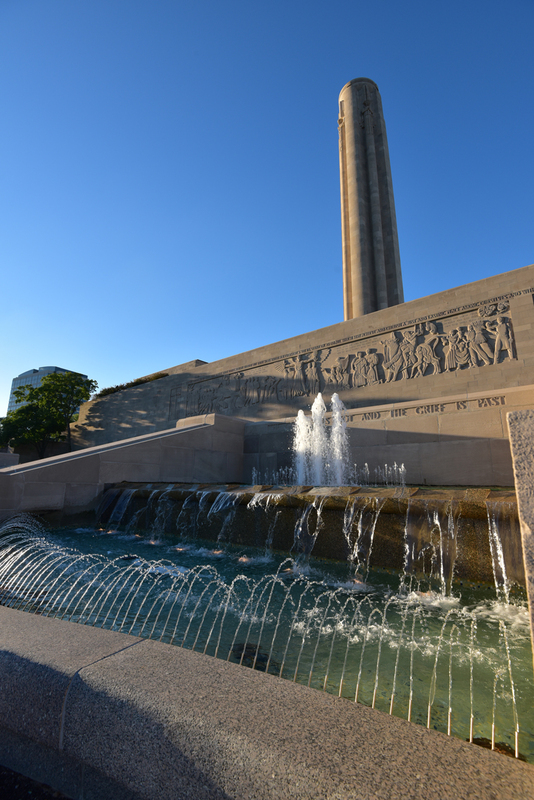 The fountain is constructed of black granite (Peribonka) and Indiana Limestone and consists of three tiers reflecting the oval form of the lower basin. 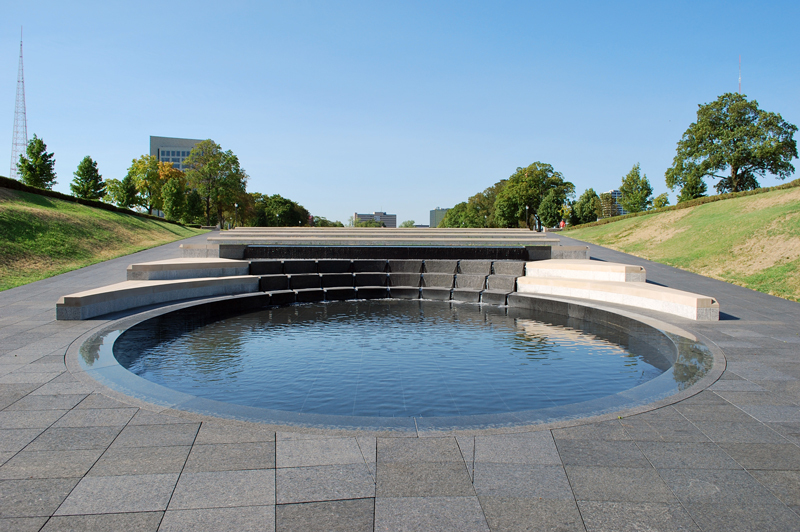 Water gently cascades over the top tier into the top basin and down the lower two tiers which have cutwater channels, directing water into the lower basin which acts as a reflecting pool. 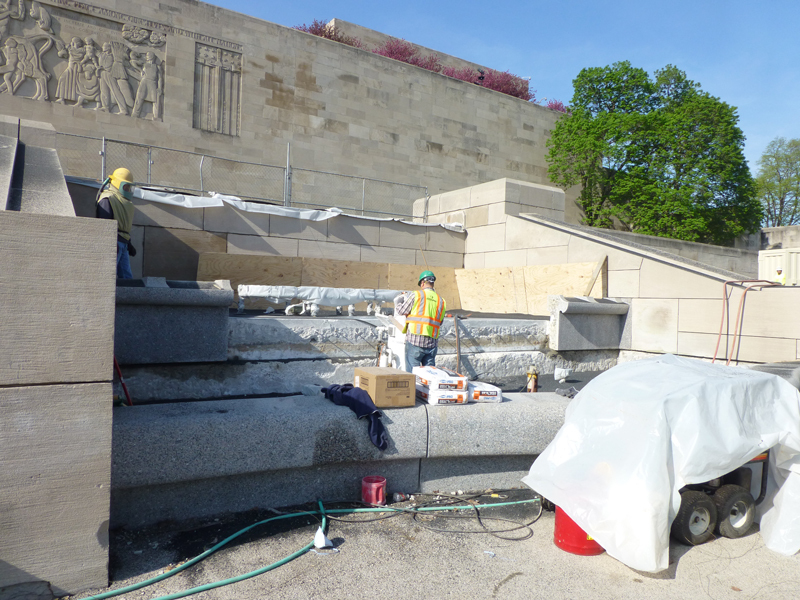 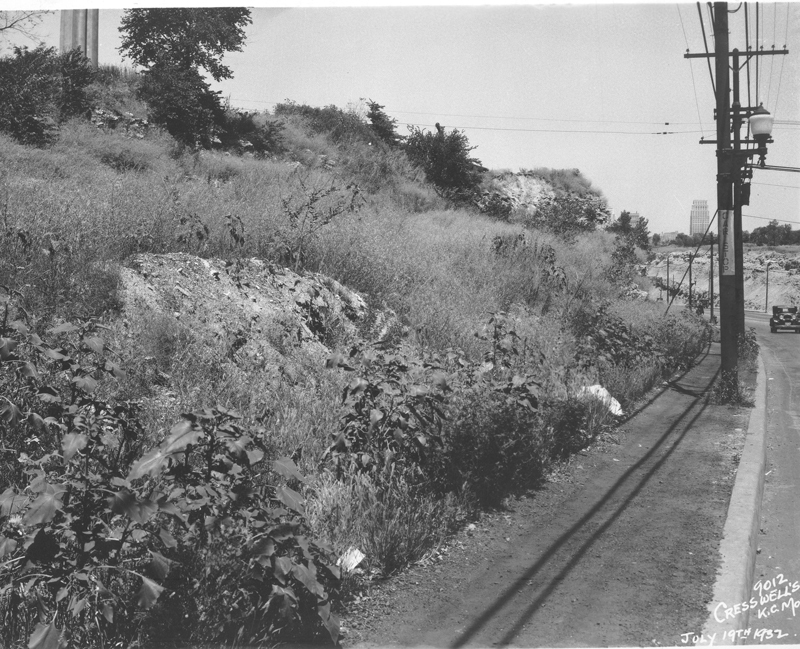 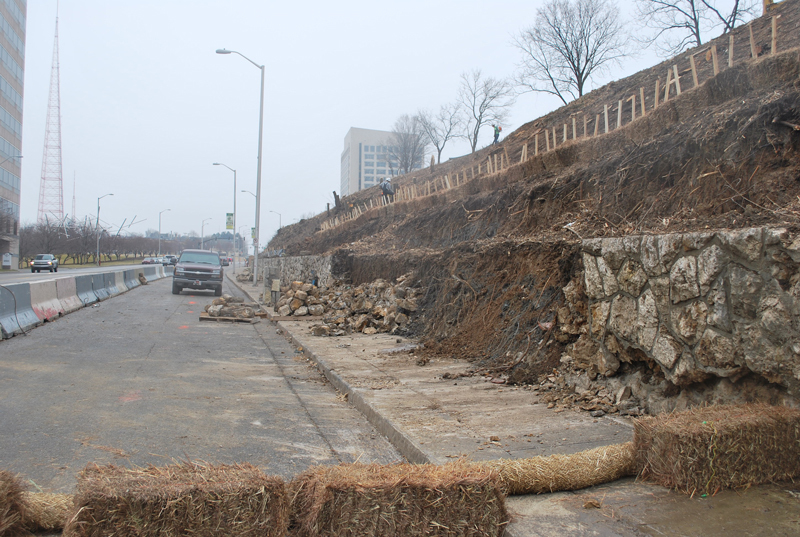 STRATA prepared rehabilitation construction documents for the South Entry Fountain and the surrounding plaza and stepped terraces. 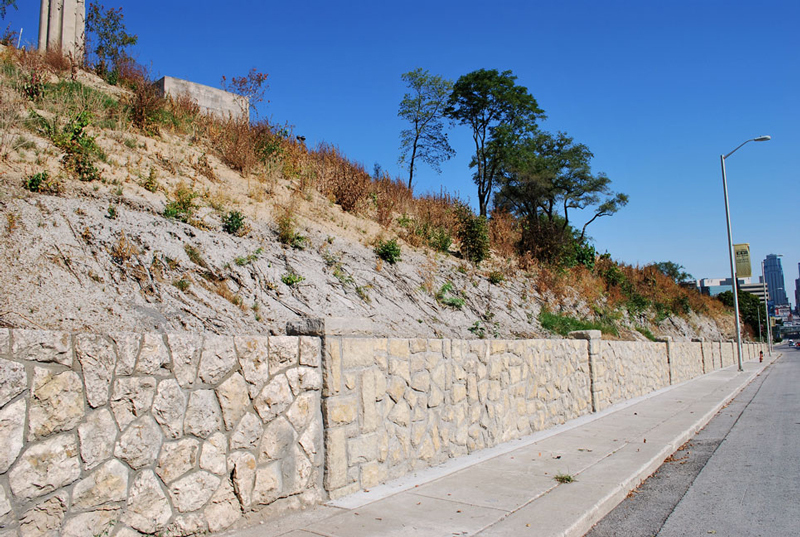 Rehabilitation work included: select stone replacement, repointing and new sealants, installation of a new skimming wall, fountain basin coating and raised basin floor, granite paver and raised pedestal system replacement and new waterproofing and granite veneer at stepped terraces.